Recent headlines have purported that organic farming is worse for the climate than conventional farming. This claim is based on a scientific study recently published in the journal Nature, titled “Assessing the Efficiency of Changes in Land Use for Mitigating Climate Change” (Timothy D. Searchinger, Stefan Wirsenius, Tim Beringer & Patrice Dumas). The study introduced a new method for calculating greenhouse gas emissions from agricultural production that includes the opportunity cost of land converted from natural habitat to farmland. We commend the study authors for working to bring a greater level of precision to measuring greenhouse gas emissions from anthropogenic activities. The science in the paper is sound, and the study was intended to present a new model using existing data and not intended to demonize organic agriculture. However, we can’t derive the conclusion that organic is worse for the environment from its findings. The study compares organic and conventional production systems growing two crops (winter wheat and peas) in Sweden. The comparison is derived from yield and input data reported by the Swedish Board of Agriculture from 2013-2015. It is impossible and irresponsible to extrapolate a global phenomenon based on two crops grown in a single country over just three years. 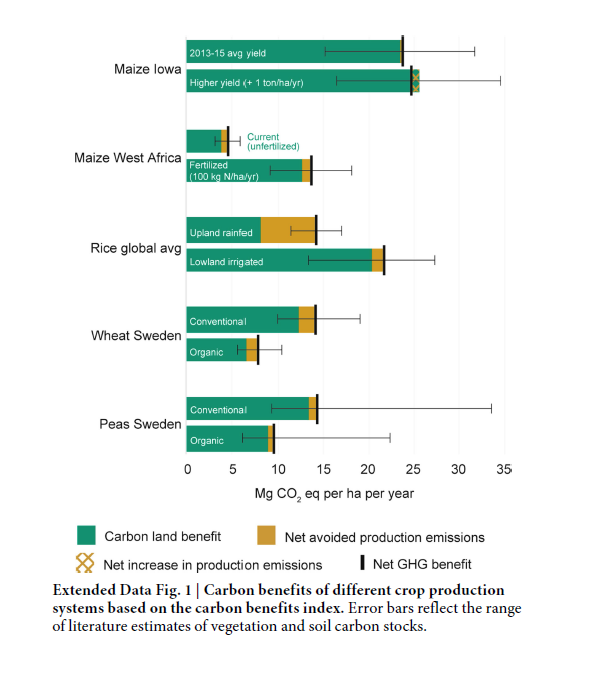 The study presents a graph that shows greater carbon sequestration benefits in conventional versus organic systems. However, the high degree of variation in the data used (as indicated by large error bars on the graph) suggests that differences between organic and conventional systems may not be statistically significant. More data should be included and analyzed before conclusions are drawn. The study duration is also too short to measure long-term effects. Source: Assessing the Efficiency of Changes in Land Use for Mitigating Climate Change. Timothy D. Searchinger, Stefan Wirsenius, Tim Beringer & Patrice Dumas. Importantly, the Searchinger et al piece ignores below-ground biological processes and interactions between plants and microbes that are the true building blocks of carbon sequestration. The study does not take into account the fact that organic systems promote soil biological diversity, which results in greater stores of carbon and nitrogen in the soil. Long-term, more carbon is stored in the soil in organic systems, and the need for external inputs is reduced. Short-term comparisons like that from the Searchinger et al study do not take into account the long-term benefit of organic farm production. Download “Regenerative Organic Agriculture and Climate Change,” a whitepaper, here. The best place to store carbon long-term is in the soil. 38 years of research at the Rodale Institute Farming Systems Trial has proven that organic farming systems store more carbon in the soil and deeper in the soil than conventional farming systems. 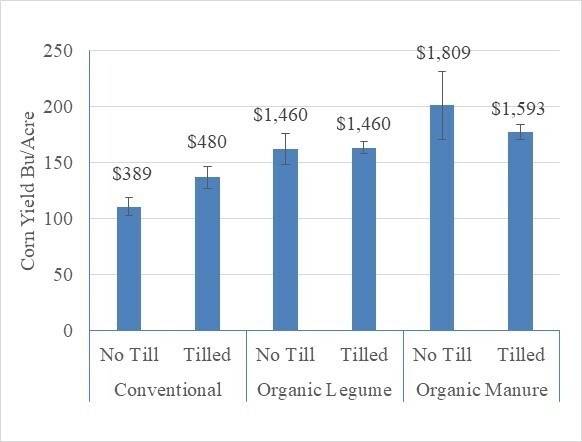 Soil organic matter data collected from the Farming Systems Trial comparing a conventional system, manure-based organic system, and legume-based organic system. The Searchinger et al study acknowledges that—when one considers inputs—fertilizer-intensive conventional methods generate more greenhouse emissions than organic, which do not use synthetic fertilizers. Their finding that organic creates more emissions comes from an interpretation that lower yields from organic would require more land clearing, and that that deforestation would have a more devastating environmental impact than fertilizer use. The flaw here (before we tackle the issue of yields) is in analyzing just one dimension of impact and assuming that we need ever-increasing yields of the same crops we grow now in order to feed the world. Greenhouse gas emissions are just one “ecosystem service,” and we can’t reduce human and environmental health to just one measure. Conventional farming practices also contribute to acute poisonings and health risks due to pesticides; groundwater and surface water contamination; loss of biodiversity including pollinators, fisheries, and wildlife; and government expenditures for cleanup. They can degrade soil health and create indirect environmental and health care costs that are difficult to quantify. As for yields, current food production has been shown to be nutritionally inadequate. Rather than focusing exclusively on yields, we’ll need to turn our attention to nutrient-dense foods in order to feed a growing global population. The Farming Systems Trial has also shown no statistically significant difference in yields between organic and conventional systems. In general, during years of adequate rainfall, there is no statistically significant difference in yields between organic and conventional systems. However, in years of extreme weather such as drought or flooding, and even years with less extreme weather like low rainfall, the organic systems out-yield conventional up to 40%. 2016 yields from the Farming Systems Trial. 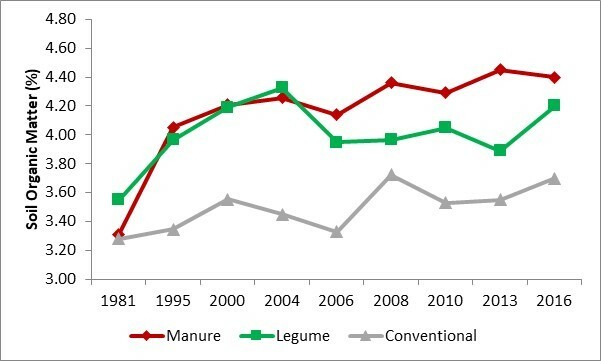 The organic manure system not only outperformed conventional but set a record for our county. Take wheat, one of the crops analyzed in the Searchinger et al study. From 2004 to 2013, there were eight years in which we grew wheat in both organic and conventional systems at FST. 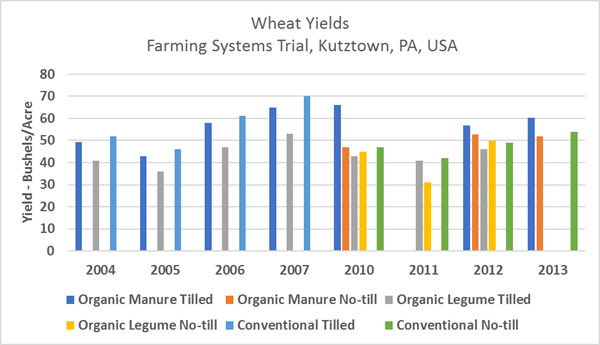 Over that time there was no yield difference between the organic (manure-based) system and the conventional system, and in 2010 the organic tilled system out-yielded the conventional no-till system by a significant measure. Both systems did outperform our legume-based organic system. Our data showing the competitiveness of organic yields has been gathered over the course of decades. Data collected over just two or three seasons is inadequate to truly assess and make widespread claims about differences in farming systems. The Searchinger et al study used a limited data set but a good calculator. Let’s contribute more data. If other farmers and researchers input their data—from different parts of the world, growing different crops, and over longer time periods—we might be able to verify the true impact of organic production. Dr. Andrew Smith is Chief Scientist at Rodale Institute.